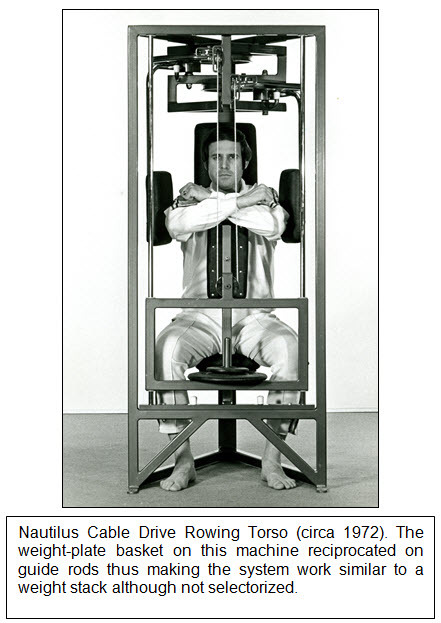 The Rowing Torso machine by Nautilus® was first introduced in 1972 and was produced until 1989*. This was a cammed, rotary-form exercise machine on which a subject performed bilateral horizontal shoulder abduction. It was often referred to as the “posture machine” because its use was believed to help prevent muscular imbalances that can cause rounded shoulders. The reasoning for this appraisal came from the fact that using this machine helped subjects to strengthen a host of muscles for a remote area of the body—the middle upper back—that are seen as vital to postural stability. This included the muscles behind the shoulders and between the shoulder blades (scapulas). It also involved some of the neck muscles indirectly. As a result of working these areas, many subjects discovered a marvelous release of tension in the shoulders and neck, something especially valuable for those who performed much of their daily tasks with the arms and suffered from tension headaches and shoulder tightness. By using this machine, a subject’s posture should indeed improve, since the muscles involved provide support to the shoulder girdle. Such a subject could also derive increased endurance—the ability to perform daily tasks longer and safer. The earliest version of the Rowing Torso was non-selectorized and featured flat movement-arm pads, a cable drive, ribbed (spider) cams and a weight-plate basket that reciprocated on guide rods rather like a weight stack. An intermediate version featured cast-iron plates instead of the weight-plate basket. Later versions incorporated the more common pin-selectorized steel weight stack and aluminum cams. Although officially there is no specific distinction between the various generations of earlier Nautilus machines, the use of hard-angled welds is a telltale sign of the period from 1970 until 1982. The Series III Line was introduced in 1982, and it featured bent tubing in many of the machine models. Conduct business legally and ethically. Buy at least 12 Nautilus machines for use in the business. Have no other exercise equipment. Exceptions to the last requirement were amenities such as sit-up boards, lockers, saunas, whirlpools, etc. This arrangement enabled Arthur Jones to explode the Nautilus name and idea across the country with ubiquitous Nautilus signs and literature in nearly every community of moderate population size. Eventually, there were said to be over 4000 Nautilus workout centers. They were not formally licensed. They paid no scheduled fees. And they were not a franchise (although they were often loosely mentioned as such). As some of Arthur’s close associates warned him repeatedly, this later jeopardized Nautilus’ control over its trademark. Subsequently, the Rowing Torso was then mostly ignored in the typical facility as an unappreciated, unstylish little machine that got stuck in the corner of the room and out of the main circuit. A large part of its lackluster appeal was that its independent movement arms were difficult to control, its cams were backwards, and its potential benefits largely overlooked. As an associated result, knowledgeable instruction was often unavailable. In 1989, Ken Hutchins crafted a cam retrofit for the Rowing Torso. This modification dramatically altered the resistance profile of the machine by creating a more ideal resistance fall-off. Ten years later, Ken fused the movement arms on the Rowing Torso. This markedly improved the subject’s control of the movement. This machine was not a mere retrofit but a mostly redesigned device. It was dubbed as the SuperSlow® Systems Re-engineered Rowing Torso. By the way, the Rowing Torso machine is known by many other names. They include: Rowing Back, Rear Delt, Reverse Fly, and Simple Row. The Rowing Torso machine was designed primarily to stimulate strengthening of the muscles of the scapulae. Commonly referred to as the shoulder blades because of their shape, the scapulae are the large, flat, triangular shoulder bones in the back of the torso that provide the foundation for the attachments of the muscles that move the arms as well as an articulation for the humerus in the glenoid cavity. Upon careful inspection, it is evident that the shoulder blades are also joined to the collarbones (clavicles) in front and embedded in the torso rather than attached to the spine. Following are drawings to provide a perspective of this anatomical complexity. 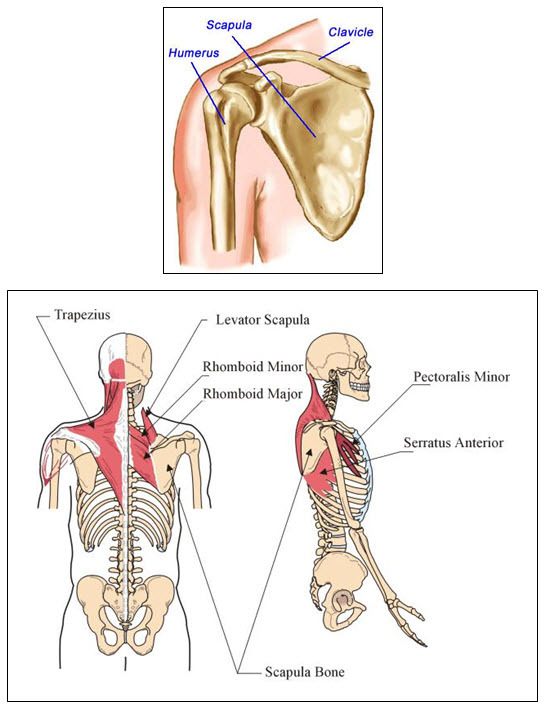 From this expansive list of structures and pictures, it is obvious that there are many muscles involved in scapular movement. Unfortunately, many of us lead modern lifestyles that can lead to disuse of these muscles, and this can result in debilitating weakness and pain. This problem is exacerbated by the fact that these structures are easily ignored in exercise programs (even strength exercise programs and therapy treatments), because they are difficult to access by conventional exercises. There is also the infamous Rotator Cuff: a group of four muscles that run from the scapula to the humerus of the upper arm. 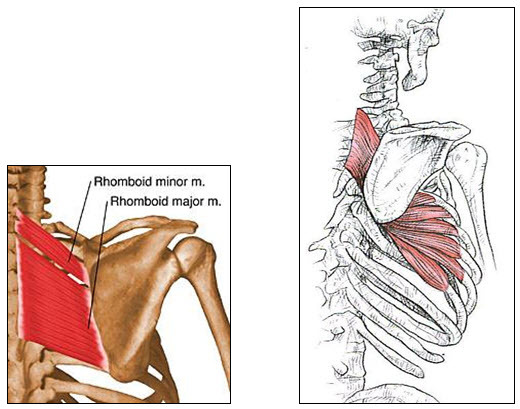 These specific structures are key shoulder girdle stabilizers. Once again, however, because of their small size and rather invisible nesting, these muscles can become damaged insidiously, after years of disuse atrophy. If any of these shoulder girdle structures break or tear, the result is a marked inability to move the arm freely. 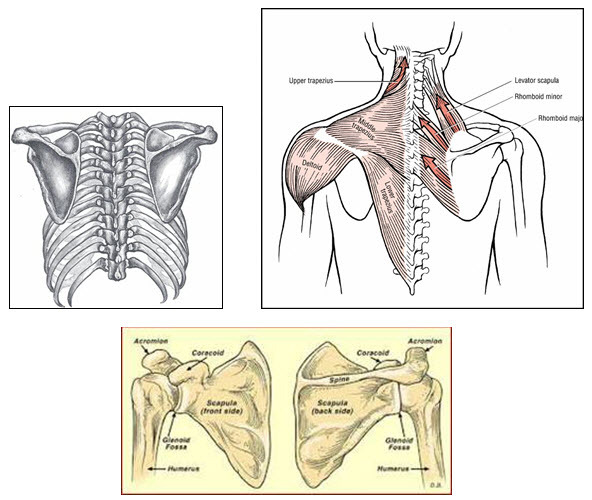 But the trouble doesn’t end with the scapular structures. The Rowing Torso exercise also indirectly involves some of the structures of the spine, most notably the cervical (neck) muscles. 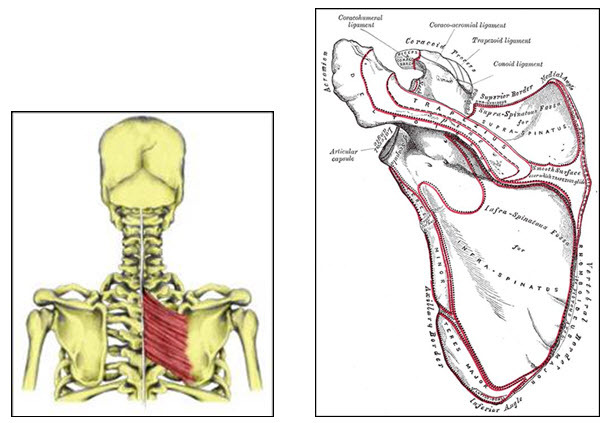 These structures, both intrinsic and extrinsic, are inextricably linked to the latticework of the numerous scapular muscles. Weakness in one muscle system can create a prolific chain reaction that affects practically the entire upper middle back area—from the base of the skull all the way down to the gates of the lower spine. In fact, the Rowing Torso can influence muscles that span all three spinal segments. Given the importance of the payload that they support, it’s ironic that so many of the scapular structures can deteriorate to such progressive fragility over time. Without the necessary strength in these various muscles, it’s no wonder that so many people suffer from weakness, pain, debility, and stress. In his textbook, Ken Hutchins likens the shoulder more appropriately to a suspension rather than a proper joint, one that depends squarely on the strength of all of its constituent muscles to keep the appropriate balance of tension between the associated structures. He also warns about the dangers of dynamic use of rotary-form machines for the shoulder, most notably arm cross, lateral raise, and pullover machines. However, despite its status as a direct shoulder machine, the Rowing Torso has earned a special dispensation because of its unique ability to provide shoulder security and a sensible movement path for the arms and shoulders. The anchoring effect of the chest pad ensures reliably stable horizontal shoulder abduction. 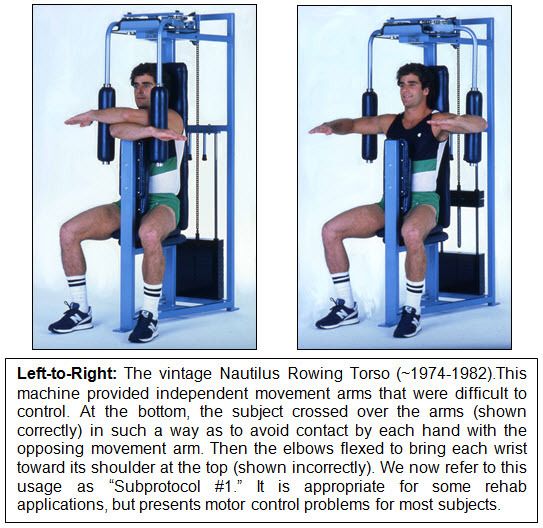 Because of this, the Rowing Torso is not only uniquely exempted from the safety concerns common to the other direct shoulder machines, but it is also credited as being an important tool in the treatment of many debilities not addressed by other exercises. It was important to the Renaissance Exercise team that we revisit and rework this special machine with the same verve and passion that we brought to the development of all the other machines in the RenEx equipment lineup. Since entry and exit are always a concern from an operational perspective in any studio, it was imperative to confront this as the first challenge. 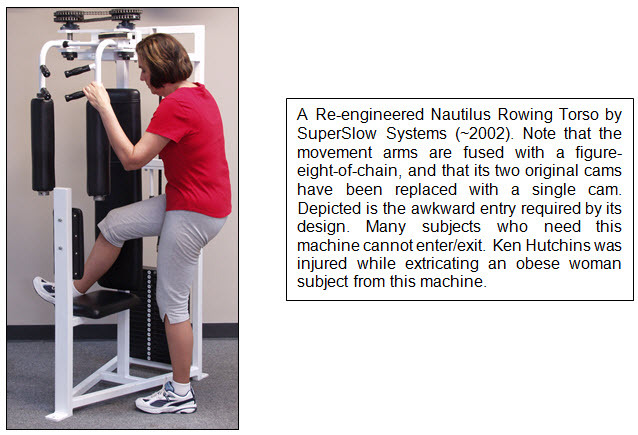 Getting in and out of the Nautilus machine had always been a significant drawback of the original machine, especially for frail and/or obese subjects. To make matters worse, many subjects experienced a kind of anxiety over the claustrophobic nature of the positioning once in the machine. In essence, once properly seated, a subject was rather “jailed” in the machine with an immovable chest pad and the movement arms in front and a back pad and weight stack behind. Of course, over time, such concerns could be overcome, but the initial challenge was always there. The RenEx machine solves the entry-and-exit problem by reversing the subject and the movement arms to face the weight stack. (Note that the early Nautilus models provided this same relationship, but still boxed in the subject.) This design completely liberates the rear of the machine thus enabling total freedom for entry and exit. It also facilitates straightforward adjustment of the chest pad to establish coaxial alignment of the shoulders. Additionally, height adjustment is managed easily with the use of an auxiliary seat pad, if needed. And with the entire rear of the machine unobstructed, an instructor can better observe the nuances of any subject’s performance. Our second challenge was the positioning of the hands and the orientation of the shoulder. 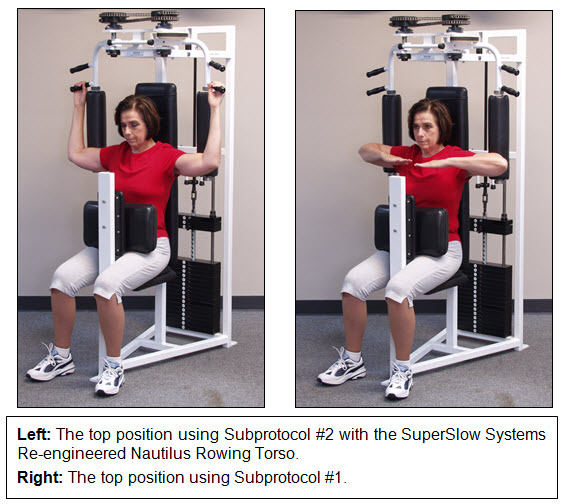 The traditional protocol on the Rowing Torso (denoted Subprotocol #1) mandated maintaining an internally rotated shoulder with the arms crossed over each. Later, an externally rotated shoulder was also possible (denoted Subprotocol #2), most recently with the provision of handles at the tops of the roller pads. While the handles proved to be a worthwhile addition to the machine and helped to solve the challenges some subjects had with certain frailties, the angle of the handles seemed to conflict with the ideal maintenance of the externally rotated shoulder. The SuperSlow Systems handles on the Rowing Torso required a less-supinated grip. Upon careful observation, this grip actually interfered somewhat with the subject’s ability to maintain the proper forearm attitude in the movement arms and engage in all the behaviors necessary to protect the shoulders and the neck. The Simple Row, by contrast, features parallel and in-line sets of handles that place the hands in a more-completely supinated position. This is a more natural and effective hand positioning that is easier to maintain throughout the set. It is also far more comfortable. Two sets of handles—an upper and a lower set—ensure that various subjects’ arm lengths can all be accommodated. Topping off this subtle but important refinement are the adjustable movement arms. With a simple pop-pin adjustment the movement arms can be moved to virtually any position in five-degree increments and accommodate a wide range of shoulder concerns. Our final challenge was the resistance curve. In part, Ken had solved this challenge when he developed the retrofit kit for the Rowing Torso and later for the SuperSlow Systems Re-engineered Rowing Torso. This new cam was nearly perfect for the action of horizontal abduction. However, there were always select subjects for whom the resistance curve was insufficient. Like the Compound Row and various other machines in the RenEx Equipment lineup, The RenEx Simple Row is furnished with a resistance-modulating cam that can be timed to match any subject’s specific range of motion. Such capabilities mean significantly greater control for the instructor and a much more personal experience for the end-user. One of the most productive and potent experiences in strengthening exercise is the pre-exhaust superset. In a pre-exhaust combination, an exercise for a particular structure is first performed on a rotary-form (or simple) machine. With practically zero rest after the completion of the first exercise, a secondary exercise is performed for the same muscular structure but this time on a linear (or compound) machine. The second exercise in the dyad involves more joints and more muscles, which then pilot the already worked primary structures to yet harder work and deeper fatigue. The result of the combined exercises represents a one-two punch, whereby the worked structures have experienced an exponential rather than just an additive effect. Of all of the pre-exhaust combinations that are available, the integrated effect of performing Simple Row PLUS Compound Row is perhaps the most formidable and exhilarating of all. When this pre-exhaustion series is successfully followed by another combination of static lateral raise PLUS Overhead Press, the result is a peerless stimulation of the shoulder and torso structures. From this general framework, additional exercises can precede or follow including internal/external shoulder rotation, cervical exercises, or even trunk exercises. The key traits responsible for the success of the Re-engineered Rowing Torso are all present in the new RenEx Simple Row, including a notably small footprint and fused movement arms, but they have been painstakingly refined. A lighter (15-lb) aluminum top plate and 1.25-lb weight increments assure that even the most debilitated subjects can get started on a program of progressive rehabilitation while the rigid frame, dual handles, generous arm pads, and ample weight stack guarantee that even the largest, most muscular athlete can intensely stimulate the upper back musculature. The Simple Row’s range delimiter features stops in five-degree increments for true precision in tailoring the user’s endpoint. 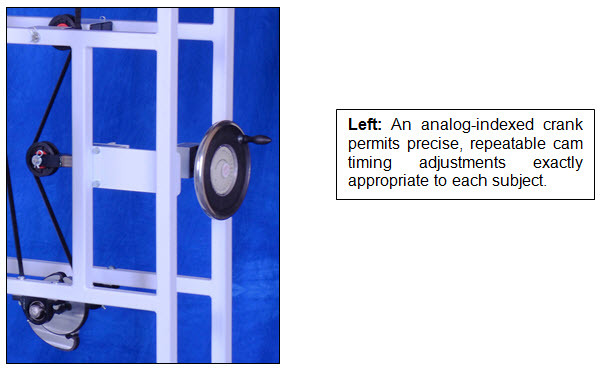 An optional load cell at the endpoint stop assures accurate load-sensing technology is always available to measure squeeze technique effort as well as providing the foundation for reliable, independent timed-static-contraction exercise at various positions in the range of motion. 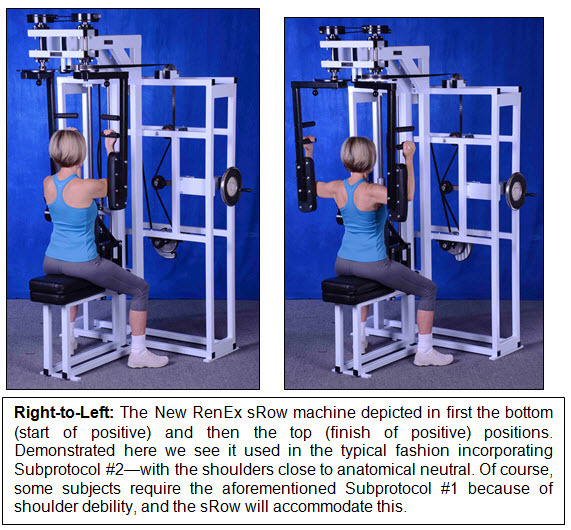 As with all the RenEx Equipment, the Simple Row machine features all the successful elements of our resistance delivery system including the Freedom Stack™ and the UltraGlide™ top plate system, which delivers resistance in fluid, anti-friction style. Regardless of how much or how little resistance you select, rep after rep, set after set, the weight stack will behave with remarkably predictable, zero-contact precision for a truly inimitable strength training experience. Whether you plan to use it for pure strength exercise, facilitate delicate rehabilitation for the rotator cuff, help improve posture, or relieve tension, the Simple Row is among the essential tools in the RenEx arsenal providing many clients with a true scapular solution. If you are interested in adding the RenEx Simple Row to your line of equipment so you can personally, along with your clients, reap the numerous results this piece produces please contact us at info@ren-ex.com or call the office at 216-292-7569. P.S. The Simple Row was unveiled to the public for the first time at The Future of Exercise Event. If you haven’t grabbed your copy of The Future of Exercise DVDs don’t miss out! CLICK HERE! This is an excellent article! Great Job! I am going to make sure everyone see’s this. This has always been a tough to get at musculature and many of my clients have these problems and are in need of a solution. I hate to rank the machines…they are all built for purpose, but this might be the most important contribution RenEx has made. Articles / machines like this make me wonder if the future of chiropractic might more closely resemble strength training. Looks great. Interesting to see your pre-exhaust suggestion. I’ve been doing a TSC Simple row (with yoga blocks) to Compound row and TSC lat raise (using a door jamb) to overhead press with clients as part of a B routine that I developed more or less intuitively. I feel validated seeing that you guys recommend a non-ghetto version. Thanks for the feedback, it’s good to hear from a person using the machines on a regular basis. Congratulations on your progress! it only gets better as your body learns the motor pattern…you are very fortunate to have access to Gus up there… in my opinion it’s the finest facility in the world. Please keep us posted with your experiences with this exercise and the others. ps; Gus trains me twice a month up in Toronto, I hope we can meet one day. I think one of the hallmarks of RenEx is that there are no frivolous pieces of equipment. Not like most manufacturers, including Nautilus who it seems at one time was trying to make a machine for the articulation of every joint…remember the front raise machine, hip flexion and forearm machine? RenEx is no hobby. If you expect medicine to taste nice, this isn’t for you. Heard on the radio today that(how they know this who knows?) that as a population we’re fatter and more diabetic…but we’re smoking less and exercising(their words) more. Reminds me of Wall-E.
You are exactly right though… we have no interest in building machines that just replicate something else out there. The goal is to provide the essentials and go all out on these pieces. The machines are not only built for their particular function, but also with thought as to how they will be integrated with each other in our workout template…the sum of the workout is more important than any of its parts. As Gus mentions, if you want to specialize on the entire shoulder girdle the sum of Simple Row, Compound Row, TSC Lateral Raise and Overhead Press is remarkable…it’s so inclusive….as a matter of fact the last time I did my “B” Workout with Gus (up in Toronto) my traps, Lateral deltoids and posterior deltoids appeared visually pumped for days after the workout. Nice article Gus. I was lucky enough to try this out at the workshop. Such a great feeling on this machine … like nothing I’ve been on before. The squeeze technique with feedback really nails it. There is plenty of weight on that machine, but it is remarkable how fast you can polish yourself off with any resistance when getting egged on by the readout on the machine if you employ squeeze. 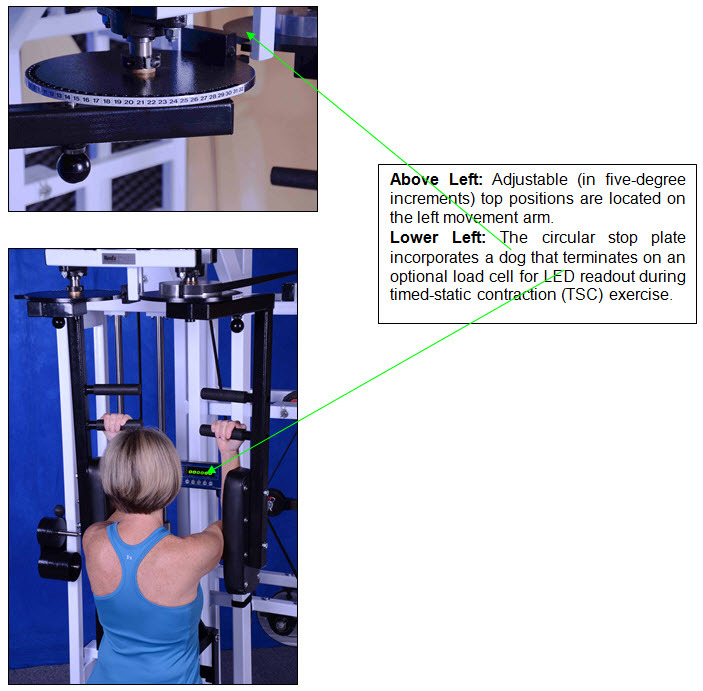 I’ve been using the readout often for TSC Simple Row for early stage rehab for my rotator cuff repair patients. Besides proved scapulohumeral movement, the placement of the new handles makes this movement doable for folks with bad shoulders. The previous placement of the handles placed the forearm and hand in a more neutral position. This coupled with having the humerus in external rotation, made the reactionary forces create a slight inward displacement of the humeral head. A side effect of this was that the A/C joint predominated the first third of the movement. 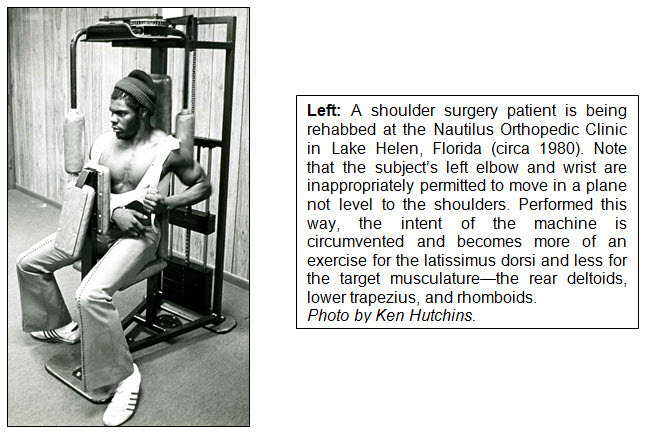 While this was OK for those with healthy shoulders, it made the exercise impossible for those with shoulder ailments. The new placement of the handles supinates the hand which has the effect of “locking” the humeral head in the A/C joint. As a result the movement seems to be initiated by the A/C joint and the scapula simultaneously. We have seen a much higher degree of folks with shoulder issues able to do the one exercise that will ultimately protect their shoulders from further and future injury. Great article! I did use this machine at the workshop and it was incredible, no comparison to anything else that was an earlier attempt to provide what this machine does perfectly. In engineering circles, the word ‘dog’ denotes a mechanism or part that stops movement (or can help to start movement via its impediment). There are a lot of claims out there from a section of the fitness community that machines do not improve functional movement and posture. What I understand of these claims are that the people using them use sophisiticated words such as kinetic chain, gravity movement patterns, than suggest using kettlebells or a swiss balls. The fitness industry follows these exaggerated claims, as they usually do and than we have people out there presciribing and making people do some type of dangerous “gravity movement “pattern”. A few years back I had shoulder surgery if I had let one of these so-called experts near me with functional movement kettlebell exercises I would think that I would ended up with permanent shoulder injury. Just in interest have you had any of these functional movement people come and try the RenEX “machines” or do they just continue on with total ignorance. GREAT COMMENT OVER ON BBS ABOUT FRICTION!!!!!!! I’m trying to stay off there it’s not productive. Read McGuff’s post and leave it at that. No need to expand the comments. No need to shop this stuff around. Anyone worth your time will seek out the source, not the other way around. Being a fitter and turner, I’d be interested in seeing an article on your production facility. With the specificity of the RenEx equipment, the machine tools and personnel must be equal to the task and an impressive thing to see. Dream Johnson does provide the laughs. The 1706lb “earth shattering” squat video..oh man. HIT is in the gutter. imo at an all time low on the forums….i’m happy to be banned on the otherwise anything goes sites. Ehhhmmm;Hate to be the harbinger doom to my superior Muslim demigods – but – and I dont know how to say this…Chocolate products, to a large extent contain a type of pork fat.As I myself, am a dhimmi of no Islamic repute, I cannot for the life of me understand, how you – the interlectually superior peoples of this earth, have failed to either notice this point, or at least introduce fatwas forewarning your Ummah on this truly horrific issue.Oh well….. Time for a blanket ban on comfort foods me thW..sn…ihoops.k. Perhaps I should’nt give my government food for thought. (if you’ll pardon the pun). db144 representing the “there is nothing new under the sun” and “another tool in the toolbox” HIT crew. It must be true as you say. Thank you for sharing this….there is an even better way to do the TSC Lateral raise prior to dynamic OHP. Thanks for the response nobody else seemed to get what I was saying about friction. You can only bang your head against a wall so many times, I think that a lot of people “can’t see the forest for the trees” if you know what I mean. Brilliant article. This site provides me with specific learning & education on the technical level I enjoy. I spent most of my Easter break watching the Future of Exercise DVD”s & listening to the discussions, up until then I thought I knew allot, it is with great pleasure I now realize I know very little about “proper Exercise” but the exciting part is that I have a path of learning ahead of me. Al’s workout had me sitting on the edge of my seat in amazement, Gus is a skilled speaker, the timing of humour was sublime. For me RenEx is the way, it shakes the tree of the so called fitness industry so the monkeys fall out, it is the future IPhone, with self belief, conviction & sheer stubborn focus swimming against the fish RenEx will provide a decent proportion of the population an effective & efficient path to a quality life & trainers who are aligned with the governing principles a good income. One thing that stood out was the behaviors displayed by you guys instructing a workout, proper strategies for exiting a piece of equipment, the “hurry up” language used.etc. Thank you for the kind words and your review. Injured helping a fat woman? LOL, that’s rich. I like to let you know that last night (our time in Australia) I purchased the Future of Exercise DVD, the purchase is under my wifes name. I am looking forward to watching them. Great! enjoy….please post your review after you watch them. Landau is being intellectually dishonest concerning SS, RenEx, Ken Hutchins role and contributions at Nautilus, etc. Where are the HITers calling David out on this? Doug? Ellington? Why is this allowed to stand? I bet this would get the musculature fatigued incredibly quickly. I love the details about the hand/shoulder positions for maximum comfort and effective target muscle loading. @Mark – In my opinion this will give Chiropractors a comprehensive tool kit to create dramatic improvements in global structural balance and function. This would allow a better focus on finding the true neurobiomechanical “lynchpin” – adjust it – and watch the body evolve with a comprehensive strength protocol like this. This would get DCs away from generic “cracking” (mainly from long standing structural imbalance, NOT a true specific spinal issue) and more precise in our ability to find the true problem, correct it, and provide comprehensive strength/rehab so the body evolves over time, not staying in a compensatory “pattern” of dysfunction. Just my opinion. Keep up the interesting work guys. “Gus, I just read your blog on the Simple Row machine. What an elucidating read. I feel like had half a day in an intensive anatomy course and yet everything was clearly explained and I didn’t once get lost in the history or any of the technical descriptions. I always appreciate coming into your studio (or should i say laboratory) but this is just icing on the cake. well well written and please don’t ever stop. Rowing machines sit in fitness clubs across the United States but are sometimes avoided since they can seem complicated. While rowing machines are generally easy to use, using them improperly could result in painful injuries. Using the right muscles while rowing will help to tone your back, shoulder and chest muscles, making it ideal as an upper body workout. By understanding the correct form for a rowing machine, you can use a rowing machine safely as part of your exercise routine.